IWIS are world-renowned manufacturers of the ultimate in automotive cam drive chains. It has taken me some years to be able to buy product from their sales team. As a company they only deal in selling in bulk. Fortunately I have discovered a source that will sell to me in relatively small quantities. This simplex chain is simply the ultimate on the market. The actual chain design has long been the choice of engine manufacturers and builders for everything up to and including monstrous output, super-high revving racing engines such as used in F1 and GT type cars. The current offering is the same chain as developed by IWIS for engine builders experiencing troubles with the V8 Minaro engine. It is the same spec as that used by Cosworth on the HB F1 V8 engine. The chains on these engines are very much longer than the very short 52 links of an A-series chains, so if they work for them, then shortened to fit the Mini/A-series that is fantastic news for us. This chain is as good as it gets. So much so that intensive testing has proven it to be more than capable of dealing with any road-sports application. After several years on my race engine it has proven perfect for race use with high poundage valve springs and high rpm. The reasoning is simple - a single row chain produces something like 40% less drag/friction than a twin row chain. That means more power to drive the car. And the gear and chain assembly is far lighter too. That can only be a good thing. Some may think them a bit costly when you can buy a Duplex kit for less than that. My answer is - quality isn't expensive, it's priceless. You get what you pay for, and those budget priced duplex chains are effectively wasted after a few hundred miles. This is a fit and forget chain. 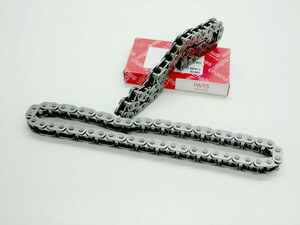 And this chain is not to be compared with the cheaper versions of IWIS chains on the market. This is a very special 'big pin' version only manufactured for CST.